Discussion in 'Lake Mountain' started by teckel, Nov 4, 2013. In this thread I'll try to keep people up to date with any snow events during the 'summer' on the mountain. Remember too, that access to the ski trails can be had all summer. Snow conditions are often better on the trails because they're higher up. Also, if there's snow the ski hire in Narbethong will be open for all your needs. The mountain's ski hire will be closed, and all the other ski hires will probably be closed too. Let's see what it's like in the morning to see if it's worth going to the mountain in the morning. I'm doing the Warrior Challenge saturday morning. This will be fun! 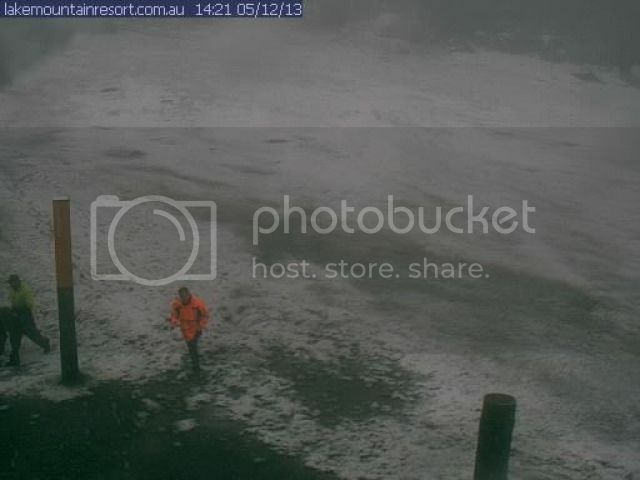 Plenty of snow at Perisher today. Ill try to duck out and get some photos. 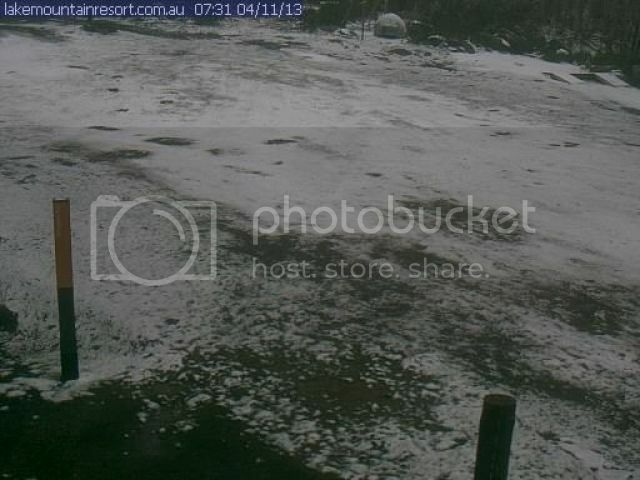 Looks like a full but thin cover this morning at Lake Mountain. I doubt it will last more than the day. Warming up and starting to melt pretty quick up here now. LM posted a photo on instagram, Looks good. wish I had have gone up, I am getting so sick of roller skiing on asphalt! probably only a thin cover though, grounds too warm this time of year. I was just thinking, LM should seal some of their tracks, would get me up there in summer more often to do some roller skiing. Maybe we could have summer laser biathlon? that would be awesome. As the trails are in National Park & not within resort boundaries, I can't see that happening. Would be good though! Email them with that biathlon suggestion - just wait until after the result of the management tender process is announced. Are there any such summer courses in Australia? Could be a winner to get top athletes there in the summer. I thought that might be a problem. Hopefully they will set up a roller ski/biathlon range somewhere one day. Apparently we don't have any so our biathletes like Alex Almoukov have to go to specific place overseas to get in training instead of doing it here. I find crit tracks are good for roller skiing but if I had a laser gun on my back I think the cops would get called because they look like real guns! The Australian/Victorian Biathlon Association would need to be involved. They may be able to leverage government funding for such a facility if none exists elsewhere, especially if the range could be integrated as a winter range. It just occurred to me - does bitumen hold snow (in the winter) as well as natural ground? If not, it's dead in the water, unless you were to use the mountain bike trails. You can't take away any winter skiing in favour of summer roller skiing. Oi! Wash your mouth out! This is the LM thread! I can't see 'proper rifles' being permitted. Firearms are banned in national parks. Solid turnout for the Warrior Challenge today. Roughly 400 people including spectators. Their running another one in April apparently. It gets bigger everytime. Good business for the region. Wouldn't have known it was on, here, other than the advertising. Drop in on your way home.